Our mission is to offer each customer one-on-one attention and the best service in the Kelowna Automotive Repair business. We have more than a quarter-century experience in automotive repairs. We are determined to keep your vehicle running smoothly and your family safe. 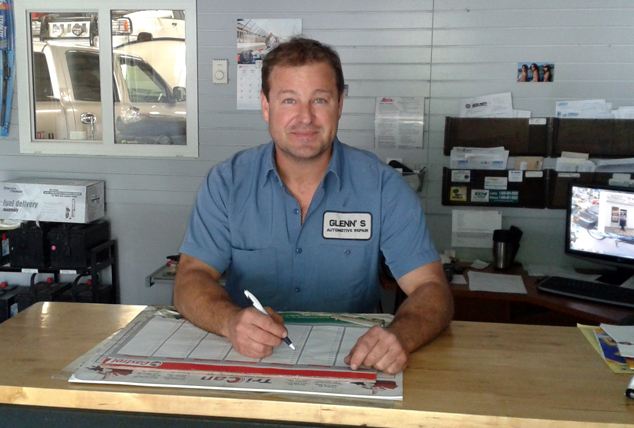 Celebrating over 25 years of business in Kelowna, Glenn’s Automotive & Transmission is a convenient full-service shop. Locally owned and operated by Glenn; a certified licensed Automotive Technician and Transmission specialist. As of July 1 2015 we have proudly become a NAPA AUTOPRO CENTRE, you can count on Glenn’s Automotive & Transmission for high standards and quality workmanship with satisfaction guaranteed. Glenn’s Automotive & Transmission stands behind its work, even offering customers a free 24 month/40,000km warranty (Parts & Labour). We also offer a NAPA 10 YEAR, 400.000 KM WARRANTY for free. Come in and ask for details. In addition, we are a Lubrico Warranty Authorized Repair Centre. Glenn’s Automotive & Transmission strives to be cost-effective, and is price competitive with all auto repair shops in Kelowna and area. Plus, we offer free warranty for our auto repairs, free road side assistance and many other perks. At Glenn’s Automotive & Transmission, we are offering the NAPA 10 YEAR, 400.000 KM WARRANTY for free. Come in and ask for details. For honest, personal and competitively-priced service, you can trust Glenn’s Automotive & Transmission for all of your vehicle needs. Call 778-484-2823 , email us or stop by today to discuss your service needs. * See Warranty section of website for complete list of details and coverage. I am so lucky to have found a mechanic for our family vehicles that we can trust. It's been 3 years of great service and we know our vehicles are safe for our family. We love to send new customers to Glenn's Automotive. It has been great to see your integrity at work. I have always been able to trust you completely, which is not always the case with people. Great guy, great prices and great experience. I've been going to Glenn’s Automotive for years and I've always been satisfied. All I can say is give Glenn a call or stop by and see for yourself!! I needed a second opinion so I asked around, M&M Transmission was highly recommended. I called him up and was very impressed with him. He said he should be able to fix the transmission in the vehicle, and said it would just cost me the price of the parts and labour. My total bill was $1382.84, which is a savings of over $3600. I was so impressed that he had it fixed by the next day and it worked fantastic. I would recommend M&M transmission to anyone that needs a great job for a fare price.